Today, I'm looking at actress Dorothy Lamour's influence on the fashion industry. Her trademark sarongs, which were originally designed by Edith Head, became a fashion craze in the late 1930's. 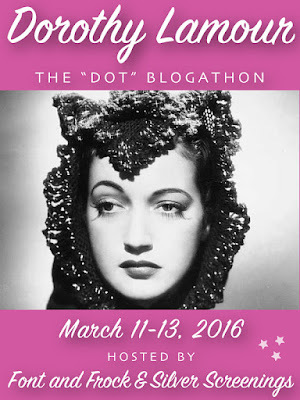 This article is part of Dorothy Lamour: The "Dot" Blogathon hosted by Font & Frock and Silver Screenings. The next time you wear a sarong, you can thank two old Hollywood icons. The talents of designer Edith Head and the exotic beauty of actress Dorothy Lamour made this obscure Southeast Asian wardrobe item an international sensation that is still a fashion staple. Like many things in old Hollywood, Head and Lamour's little Polynesian dress came from a combination of luck, timing and talent. Here's the story behind one of the most recognizable costumes in movie history. Lamour's journey to old Hollywood icon began in 1935 when she was unknown contract player at Paramount Pictures. The studio was having trouble casting the female lead for a B movie called The Jungle Princess, a goofy Tarzan knock-off that was part of the mid-thirties craze for South Seas movies. Actress Evelyn Venable was the studio's first choice, but she flatly refused. Studio executives then turned to Lamour, a popular big band singer who just had a bit part in her first Paramount movie, the comedy College Holiday (1936). Dorothy Lamour and her sarong sisters in The Hurricane (1937). Lamour was perfect for the part of Ulah, a Malaysian woman who lives in the jungle with her pet tiger until she falls for a dashing Englishman played by Ray Milland. Although Lamour was born in New Orleans of Creole, Spanish, and Irish descent (she never visited the South Seas until she was in her 70's), her dark beauty and flowing hair gave her a Polynesian look that was plausible for thirties audiences. The task of designing Lamour's costumes fell to Edith Head, who was then one of Paramount's top three costume designers. The Jungle Princess presented her with a unique challenge: she had to make Lamour look sultry and culturally appropriate and satisfy the movie censorship code. Head decided to adapt a traditional Southeast Asian wardrobe item, the sarong, into the perfect costume for Lamour. Dorothy Lamour and a baby crocodile in a publicity still for The Jungle Princess (1936). Ironically, traditional sarongs are usually worn by men in Southeast Asian countries like Indonesia, although there are female variations of the garment. They are made from colorful fabric that is draped around the waist and worn much like a kilt. Head kept the sarong's signature draping and brightly colored floral patterns and made them into a short dress that looked sensational on Lamour. The Jungle Princess was a huge hit, and both Lamour and Head followed up with another sarong-athon in director John Ford's disaster epic, The Hurricane (1937). Soon, the costumes Head designed became a national sensation. Women everywhere donned sarong-draped evening gowns and dresses and skirts in bright floral patterns that imitated Lamour's glamorous look. 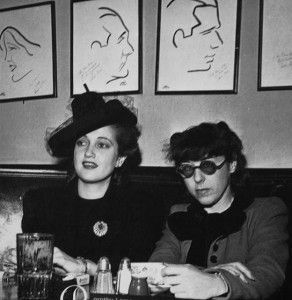 Pals Dorothy Lamour and Edith Head at Hollywood hot spot, The Brown Derby. Lamour continued to wear her signature sarongs throughout her career, especially in her "Road" movies with Bing Crosby and Bob Hope, although they weren't always designed by Head. For her part, Lamour expressed mixed feelings about being labeled the "Sarong Queen" of Hollywood. While she readily admitted that the sarong put her on the map -- "thank God for that little strip of cloth," she told People magazine -- she often lamented the fact that typecasting limited her choice of roles. "I made 60 motion pictures and only wore the sarong in about six pictures, but it did become a kind of trademark," she told People. "And it did hinder me. They expect you to always be the young girl leaning against the palm tree. Why should you want to act?" Despite Lamour's misgivings about her sarong-draped image, she and Head were always fond of each other, according to David Chierichetti's biography, "Edith Head: The Life and Times of Hollywood's Celebrated Costume Designer." Head designed Lamour's wedding dress and the star told Chierichetti that "she [Head] is the kind of person that I may not see for several years and then I run into her, and we start talking, and it's like we had been talking just the day before." Head's design is still iconic today and one of the sarongs Lamour wore even made it into the Smithsonian Institution's costume design collection. Click here for my second Dot Blogathon entry on The Road to Singapore. Thanks for sharing the backstory behind Dorothy Lamour's famous sarong. It is unfortunate it typecast her, but could a person argue that typecasting the result of having done something really well...? It was interesting to learn the challenges Edith Head faced in designing the costume, and I'm glad to learn she and Lamour remained friends for years to come. Thanks for joining the Dorothy Lamour Blogathon, and for bringing tropical wear with you! You're right. Not everybody looks fabulous in a sarong. I recently read James Cagney's autobiography and constantly complained about being typecast as a tough guy, but he never seemed to realize that he was sensational at it. This was fascinating to read about the history of the sarong and the friendship between Lamour and Edith Head! I knew she was called the sarong girl, but did not realize quite the influence she had. I think it was an art form. I have a book about thirties movies, and the pre-code costumes were barely there. A shame about Lamour's typecasting, but it was very interesting to learn about how the sarong became a fashion staple. Edith Head's costumes are important to so many films! There was no one like Edith Head. She designed so many iconic costumes. Fantastic post! Typecasting is horrible, but the sarong was a blessing in Dorothy's life. Now I'm tempted to buy one for myself this summer, LOL!